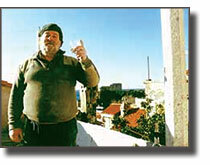 Pero Miljkovic is a well-known sculptor and bon vivant from Dubrovnik, which was mostly destroyed during the Croatian war for independence, but has again become a tourist-attraction. The film begins with the friendly host telling us about his life, at first without explicit reference to where the pictures were taken. Broken English and German soon give way to a warm flow of words in Croatian. Little by little, the sculptor’s words convey how people there were changed by the war – with points of view being represented that might sound scary to our Western ears.